42,36 RAN # ( — #) random number between 0.0 and 1.0. The STO key can be used to set the seed, which is set to zero at initial power up or when the continuous memory is reset. 41 ON none turns calculator on or off turns calculator on or off. No instruction is entered. If hit twice when in programming mode, the calculator will come back on in run mode. IRMI stands for "Inserts Run Mode Instruction". It describes keys whose programming mode behavior is to insert an instruction which behaves like the run mode behavior of the key. 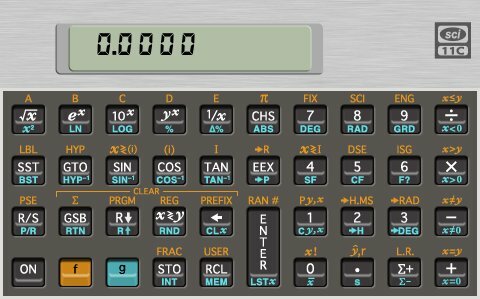 The HP-11C is a programmable, reverse Polish notation calculator. The only data type is the floating point number. (Flags, instructions?) The floating point numbers have a mantissa with 10 decimal digits and an exponent with 2 decimal digits, both which can be signed. The amount of precision may be greater than what is displayed. Holding the PREFIX key will show the entire mantissa for the number in the x slot. The stack effect of a number key depends on the previous key. If it was also a number key, then the value of the x slot is modified by appending the new digit to the representation. If the last key was not a number key then the new digit is pushed onto the stack as an integer. If EEX is pressed during number entry, numbers before the EEX press become the mantissa and numbers after become the exponent. If more than two digits are pressed after the EEX only the last two are used for the exponent. EEX can also initiate number entry in which case the mantissa is one. Stack effect notation describes how an operator alters the stack. The stack operator uses the slots listed on the left as arguments and replaces them with the values listed on the right. If there is one fewer values than arguments, other values in the stack will move down a slot and the t value will be duplicated. If there is one more values than arguments, other values in the stack will move up a slot and the t value will be discarded. The HP-11C has a stack with 4 slots. These are the slot names. When a number is pushed, the value in the t slot is lost. When a number is popped, the all the values move down one slot. The value that was in the t slot gets duplicated, so that it is now in both the t and z slots. The STO key is used to put the value in the x register into one of the above registers. After pressing the STO key, enter the name of the register. The f prefix must be used to enter I. After a value is entered in a register with the STO key, the previous value is lost. The RCL key pushes the value in a register onto the stack. The name of the register is entered after pressing the RCL key. The registers can all be set to zero with CLEAR REG. All registers except for the I register can be appropriated for programming instructions. Attempting to store a number or recall a number from an appropriated register results in Error 3. The registers are appropriated in the reverse of the order listed above; that is starting with .9 and ending with 0. Pressing and holding the MEM key will show the highest available register available for use. Pressing CLEAR PRGM in programming mode removes all programs and frees all registers for use. Error 6: a flag other than 0 or 1 was provided to CF, SF, or F? Programming notation with line number. To change the punctuation used for the radix mark, turn of the calculator. Press the ON key and hold it. Press the . key and hold it. Release the ON key, followed by the . key. The radix mark can be toggled between a . and a ,. The thousands separator will change correspondingly to a , or . 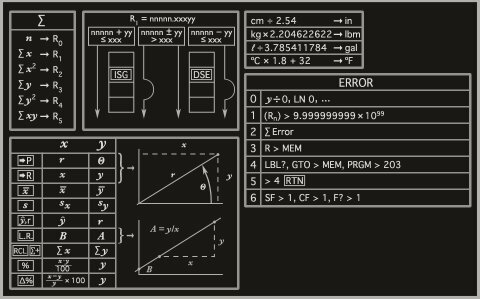 To reset the continuous memory and return the calculator to its initial factory state, turn the calculator off. Press the ON key and hold it. Press the — key and hold it. Release the ON key, followed by the — key. Hit any key to clear the Pr Error message.